[S1062] 1921 Canada Census, Ferguson # 4167. [S1063] 1901 Canada Census, Ferguson # 9785. [S1064] 1891 Canada Census, Ferguson # 9785. [S923] F. S. A., Scot. Alexander MacKenzie, History of the MacDonalds and Lords of the Isles, page 303. [S746] Wikipedia, online http://Wikipedia.com, https://en.wikipedia.org/wiki/William_Sinclair,_2nd_Earl_of_Caithness. Biography*: SIR WALTER DE OGILVY OF DESKFORD AND FINDLATER, had a charter from Margaret of Glen, his grandmother, for the lands of Wardroperston which would fall to him after the death of Isabel, his mother and daughter of the said Margaret, and Walter de Ogilvy of Lintrathen, his father and spouse of the said Isabel, on 6 November, 1419. He obtained the lands and baronies of Deskford and Findlater upon his marriage to Margaret, daughter and heiress of sir John Sinclair of Deskford and Findlater, and in contemplation of which they had a Charter under the Great Seal for these lands on 11 August, 1440. Married Name: As of circa 1437,her married name was Ogilvy. [S861] Ancestry.com, online www.ancestry.com, https://www.ancestry.com/family-tree/person/tree/108749829/…|3|5|v2fsdgvyier1bmtlbgqgtg9yzcbpz2lsdnkgdmfuief1y2hszxz5biblbibezxnrzm9yzcbtagvycmlmzib2yw4gqmfuzmz5c2hpcmugsul8twfyz2fyzxroysbmywr5ifnpbmnsywlyihzhbibezxnrzm9yzcblbibgaw5kbgf0zxi1&mpid=230134186858≠c=0&Hints.hintStatus=Pending. [S220] Rev. A. MacDonald & Rev. A. MacDonald, The Clan Donald. [S923] F. S. A., Scot. Alexander MacKenzie, History of the MacDonalds and Lords of the Isles, page 331. Biography*: Dòmhnall Gallach succeeded to the chiefship after the death of Gilleasbaig Dubh. In 1521, the chief rendered a bond of manrent to Sir John Campbell of Cawdor. A and A Macdonald stated that this bond may have led the Sleat chief to follow Cawdor, in 1523, on the Duke of Albany's campaign against England. 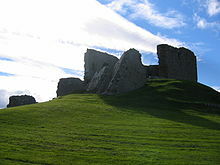 The campaign did not go well for the two chiefs, as both Sleat and Cawdor's names are recorded on a remission for leaving the field of battle during the siege of Wark Castle. A and A Macdonald also stated that it was likely on their return from the borders that Cawdor and his followers (including Sleat) murdered Lachlann Cattanach Maclean of Duart, in Edinburgh. In 1524, Dòmhnall Gruamach entered into an alliance with the chief of Clan Mackintosh; and later in 1527, he entered into bonds with Mackintosh, Munro, Rose of Kilravock and Campbell of Cawdor. In 1528, Dòmhnall Gruamach received considerable support from his half-brother, Iain, son of Torquil, chief of Clan Macleod of Lewis. That year their combined forces were successful in driving out the Macleods of Harris & Dunvegan, and their vassals, from the barony of Trotternish. Dòmhnall Gruamach, in return, then aided Macleod of Lewis in obtaining effective possession of Lewis. [S923] F. S. A., Scot. Alexander MacKenzie, History of the MacDonalds and Lords of the Isles, page 154.